As a Vietnam veteran, Fang Wong remembers how veterans of that war were treated when they returned home. It’s those same veterans’ responsibility to ensure a similar homecoming doesn’t await the men and women who are fighting the war on terror. That was part of the focus of Wong’s acceptance speech in Minneapolis Thursday after being elected The American Legion’s national commander for 2011-2012. The New York Legionnaire and member of Lt. B.R. 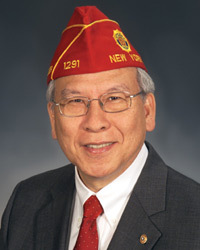 Kimlau Post 1291 in New York City said the future of the organization depends on welcoming younger veterans into the fold, as well as advocating on their behalf. Wong – who was sworn in by Past National Commander John Brieden and presented the colors by Past National Commander Ron Conley – promised to represent and advocate on behalf of all Legionnaires, as well as the policies of the organization. He presented a list of priorities for the year. Membership: “We all know that training and leadership are two of the key ingredients for a successful organization,” he said. “In order for the Legion to survive, we must develop and provide meaningful training so that we all can do our jobs better. Health Care: “We must stay on top of both DoD and the VA to ensure medical facilities are well-staffed and funded for those who require treatment,” he said. “We will continue to study the PTS and TBI issue so that the best methods can be determined and provided to those in need. Wong said his projects this year will be the Child Welfare Foundation and The American Legion Legacy Scholarship Fund. He also presented his theme for the year – “We Serve With PRIDE” (People-Research-Ideas-Develop-Execute) – and his membership incentive program. Any Legionnaire who signs up, transfers from DMS, or renews a combination of eight Legion members will receive a “Super Eight” eagle PRIDE pin.